Omsk State Pedagogical University is one of the leading pedagogical higher education institutions in Russia and a large educational complex of Western Siberia with its 80-years history and deep rooted scientific, methodological and cultural traditions. 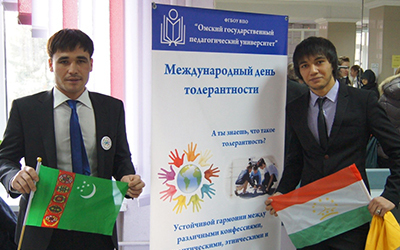 Main mission of OSPU lies in preserving and multiplication of intellectual values, in getting and dissemination of modern knowledge and information in the process of educating people from Siberia by integrating curricula, scientific research and innovation approaches. During its history OSPU has been developed into modern scientific educational complex which consists of 9 Schools including Business School, Academic Lyceum and University College offering the programs of secondary and vocational secondary education. Schools and Departments of the University implement higher professional educational activities in 33 directions of the Bachelor Degree and 12 directions of the Master Degree. There are 2 modes of study: full-time and part-time education. OSPU provides 2 Doctoral Programmes (the 1st and the 2nd doctoral degree) and Ph.D. dissertation committees. The University uses the most up-to-date teaching techniques, including the elements of distance learning. University has a sufficient physical infrastructure: eight academic buildings, three residence halls, a health camp, a transport park, training workshops. There are 5 refectories and 8 lunch counters in OSPU. History museum of OSPU represents the information about university development, its traditions, teachers’ biographies and achievements. Since 2001 the Career Agency “Zolotoi Fond” has been functioning at OSPU to assist students and alumni in finding employment, mainly in the education sector. In accordance with the goals of Russian higher education, the development of international cooperation is one of university’s priorities. 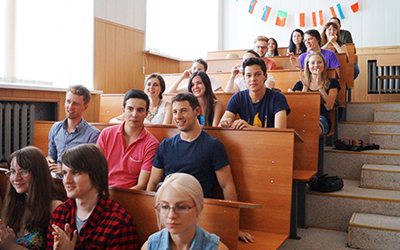 OSPU takes the leading position among Omsk Universities in amount of international students and trainees. The citizens of Austria, Belgium, Germany, Egypt, Italy, Kazakstan, China, Kyrgyzstan, Mongolia, Netherlands, Slovakia, the USA, Thailand, Turkmenistan, Turkey, Ukraine, Uzbekistan, France, Czech Republic, Switzerland, Sweden, South Korea and Japan have studied at the University during the last two years. Office of International Cooperation and Inter-University Center for International Cooperation and Academic Mobility based on it arrange international teachers, researchers and students exchanges, monitor the agreement’s accomplishment, organize accepting international students to study in OSPU. Besides, the Center administers the State Test of Russian as Foreign Language with following certificate issuing. The Department of Russian as a Foreign Language has been a fixture of the School of Philology in Omsk State Pedagogical University since 1991. Nowadays the Department has a great experience in teaching foreign students with different proficiency in Russian, including ones who have never studied Russian before. Since 2005 in cooperation with the Ministry of Education and Science of Russian Federation and Russian Consulate General in Strasbourg (France), as part of the Agreement of Cooperation with Klagenfurt University (Austria), Summer School of Russian language and culture is held in OSPU. In the last 2 years more than 100 foreign citizens have attended Summer School and got familiar with sights of both Omsk city and Omsk District. In order to help foreign students to adapt successfully and develop cross-cultural dialog, Intercultural Communication Club “Aliance” was created in 2007. The members of the Club organize creative events, cross-cultural and ethnographic festivals, which acts to raise the level of tolerance in the field of cross-cultural communication. Environment plays an important role during annual trips to “Irtishsky” health camp, where foreign students have a chance to participate in university social life, which also helps them to adapt to Russian-speaking environment more effectively. Interuniversity sports competitions, such as basketball, volleyball and chess, regularly held on the base of OSPU, have already become a good tradition. Russian – TORFL and TORFL for Russian Citizenship. Thus, people from Omsk and other cities come to pass TOEFL iBT that is the most widely accepted in the world. Students can use the test to study in the U.K. and other European countries, Australia, New Zealand, Hong Kong, Singapore, Japan and Korea in addition to the U.S. and Canada. To register for the test you should visit the official site www.toefl.org. Exam in French DELF or DALF is officially accepted by the French Ministry of Education and European Council of Foreign Languages. To learn more about these tests please visit http://www.ciep.fr. Once a month TORFL is being held at OSPU for foreigners who seek to obtain Russian Citizenship - www.testrf.ru.